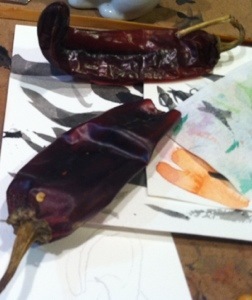 Just a tease today: I’ve been painting a few etegami using these dried New Mexican chiles as models (thanks Jessie for the bag!). Expect: some puns and some Basho haiku! And yes, I did nibble on one of the chiles.